Zara, the mate of Valo the fox. Note: This is the first in a series of posts I'm going to be making as a reality check to potential fox owners--things that must be considered, but time after time I see newbies glossing over or completely ignoring. The tone here might not be friendly and I may come across as heartless, but I only have the best interests of your fox (or potential fox) at heart. So, you’ve done all your homework on their needs and care, and you’ve decided that yes, owning foxes is for you. You look up your state laws, and it turns out that they are legal pets in your state! In fact, they even issue permits specifically for foxes! Just sign up for that and you’re in the clear, right? I find a lot of fox owners don’t seem to have a clear grasp of how the law works, and innocent foxes pay the price for it every year. Many people are under the mistaken impression that “State Law” always overrides city or county laws; if the state says it’s okay to have a fox, then it doesn’t matter what the city says. This could not be further from the truth. The reality is that the more restrictive ruling always applies. If your state says “no”, but your city says “yes”: No, you can’t have a fox. If your state says “yes”, but your city says “no”: No, you can’t have a fox. It doesn’t matter if you have a state permit. It doesn’t matter if you’re a nonprofit sanctuary. It doesn't matter if you're inspected and licensed with the USDA. It doesn’t matter how much you love the animal or how good your care is or how responsible you are. If your city has an ordinance against owning foxes, and you buy a fox, you are breaking the law, and you are in the wrong. To reiterate: if your city has an ordinance against foxes, it doesn't matter if you have a state permit. It also doesn't matter if the "State Division of Wildlife" or "State Department of Natural Resources" official who issued your permit told you that you are in the clear. Typically that individual only knows what the state laws are; while many do know local laws throughout their districts, not all do. And knowing the local laws is not their responsibility--it's yours. It's your responsibility to make sure there are no state laws against owning foxes. It's your responsibility to make sure there are no county laws against owning foxes. It's your responsibility to make sure that there are no city laws against owning foxes. If you fail in your responsibility to make sure you are legally in the clear before obtaining a fox, and your animal is confiscated and/or euthanized because of it, then that animal's death is on your hands. Not the city, not the state, not the county, not the mean government officials who are just doing their jobs by enforcing the law--it is your fault for keeping an illegal animal. Very true I live in Ohio and found my township does not allow them ,sadly. Okay, I live in Missouri. And I have been told from multiple people that as long as I have registered a fox that they are legal. I called Missouri Wildlife and the Department and was told to get a license...simple to do here. But it is very difficult to get a clear answer here. In Kansas it is legal apparently. 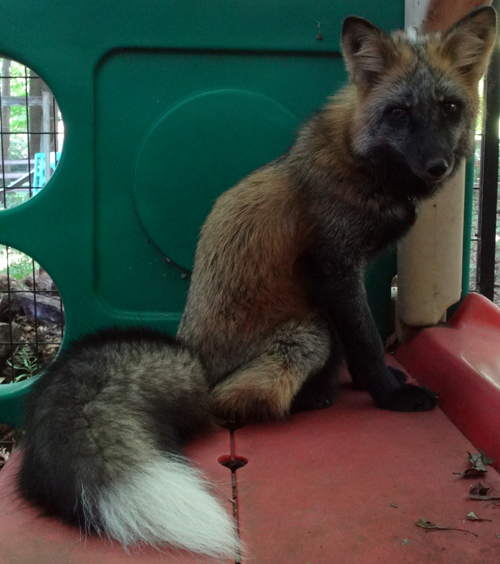 I was told by a breeder I can own a gray fox in MO. But I always want to be sure because I definitely don't want my baby to be taken away. (We were planning on getting one this spring/summer. Does anybody know if there's a website where you can check specific cities in Arkansas for the exotic pets law? I was planning on moving to Ash Flat, Arkansas because it's a small population, but I can't seem to find any number to call to see if owning a pet fox is legal. Also: if anybody has a suggestion on cities that allow pet foxes, I'd appreciate an email. Not planning on getting a fox, (I dunno why anyone would want one; they belong in the wild, just get a dog or cat.) dunno how I ended up on this page, but I have to say this: It's BOTH parties' fault. If I were stupid enough to blow off my hand with an illegal firework, then yes it was my fault for having an illegal firework, but at the same time if the EMTs don't do THEIR job, and I bleedout, it's ALSO their fault for acting irresponsibly. Illegal or not, that fox didn't deserve to die and the city acted irresponsibly regardless. Nor does the woman deserve the blame game after losing beloved pet to idiots.